Where (if anywhere) were X-ray machines put on trains or trolleys to image “Everybody over 14 years old”? The background image in this X-ray analysis sotfware page shows what looks like a trolley or train car on tracks with a sign that says "X-ray Now: Everybody over 14 years old". Where might this have been and when? Was this practice widespread worldwide at some time in the past? What was the advertised purpose, and if there was an underlying purpose different than that, what might it have been? It was in Glasgow in 1957, as part of the city's fight against tuberculosis. 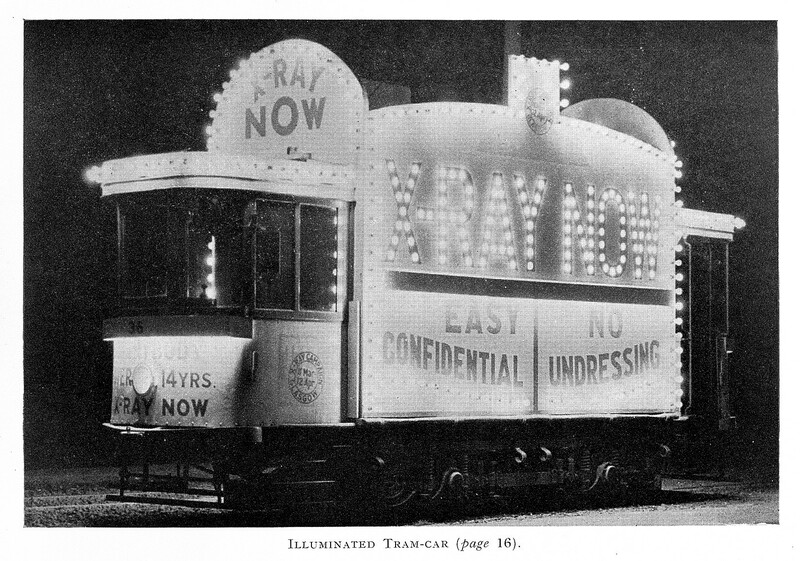 It's worth noting that the X-Ray machines weren't actually on the tram. It was simply used to advertise the campaign. 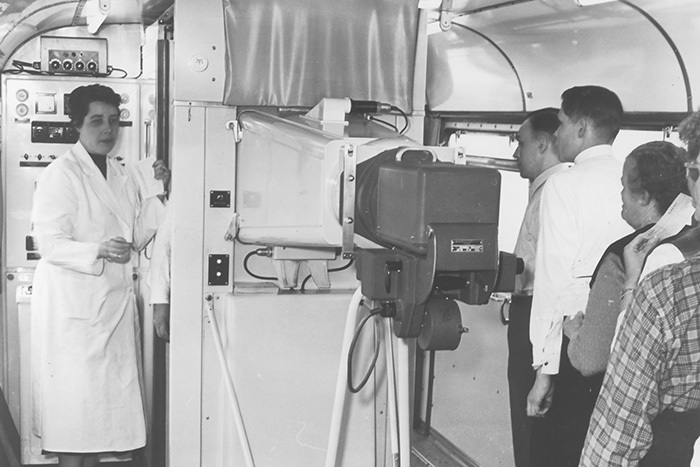 Mobile X-Ray units were used in the UK (the Mass Miniature Radiography (MMR) programme), but in vans, rather than trams. Similar mobile units were actually brought back into use in London in 2005 to tackle a rise in TB cases in some areas of the city. Despite reduced incidence of tuberculosis in England and Wales, Scotland, and in particular Glasgow, had been dogged by tuberculosis throughout the immediate postwar period. By the 1950s the Department of Health for Scotland was committed to reducing the incidence of the disease by creating an X-Ray campaign accompanied by a media 'blitz'. As part of Glasgow's X-Ray campaign against tuberculosis, 11 March to 12 April 1957, Glasgow Corporation produced this large advertisement to be displayed on the side of a tram car in the city. Though it was not on public transportation, busses were used in Denmark in the 1950's as mobile platforms for tuberculosis detection. Since 2014 similar mobile X-ray equipment has been used to detect tuberculosis among homeless. This was certainly very widespread, with variations, in many places or nations around the world. 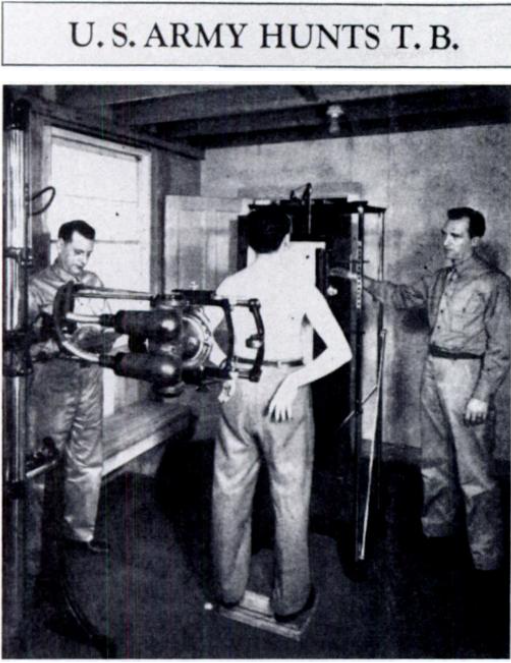 The purpose was to mass-scan the populace with healthy or harmless X-rays for signs of tuberculosis and other illnesses in the picture of the lung. 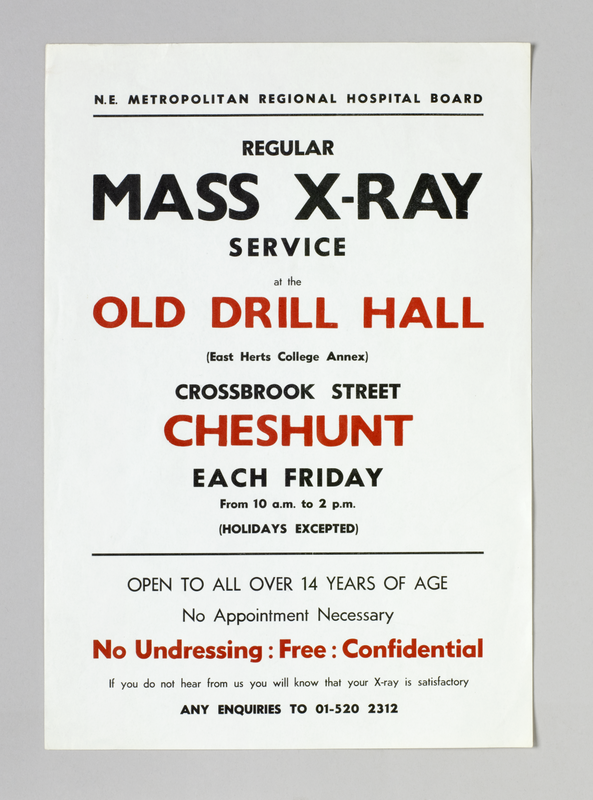 Pamphlet detailing the Mass Miniature Radiographic Unit, manufactured by Siemens, dating from the mid-Twentieth Century. The pamphlet shows the floor plan and a variety of internal pictures of the Unit to show the suitable arrangement of the Unit. 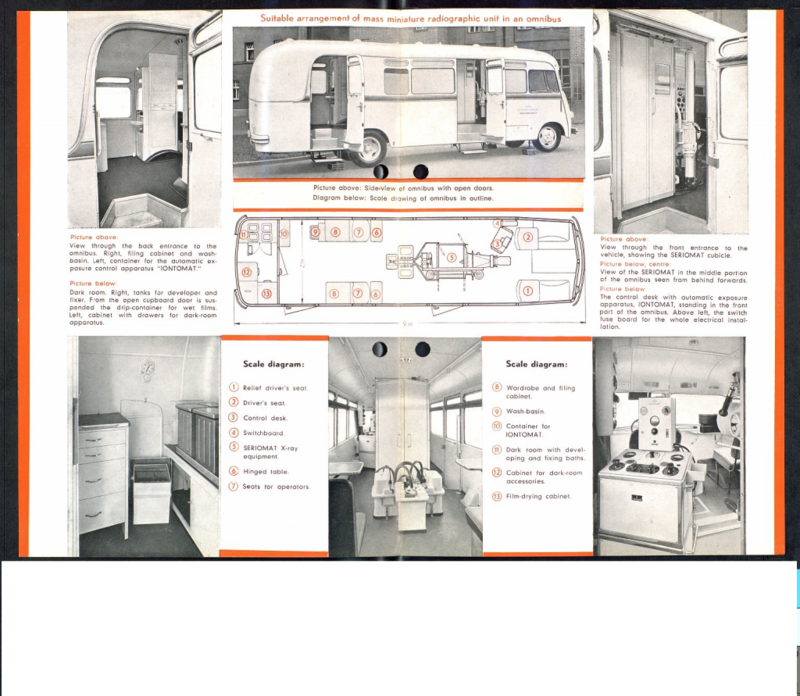 Presumably produced as part of the advertising output of Siemens for this unit, the pamphlet provides the viewer today with a visual map of how the Unit might have looked during their major deployment from the 1940s until the 1960s. U.S. army hunts tuberculosis. Photograph accompanied a front-page story in General Electric X-ray Corporation’s newspaper, the Victor News, in July 1941 . General Electric reported that the army had just purchased 45 of its 4 x 5-inch photoroentgenography units for shipment to various induction centers throughout the country. The boned looking private on the right was proudly identified as an inducted General Electric employee. 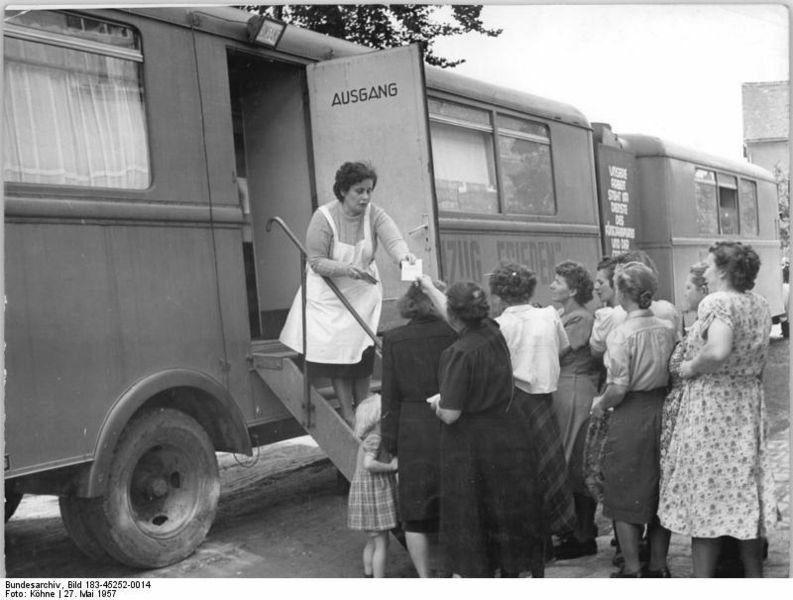 The procedure as such – the Röntgenreihenuntersuchung – although not mobile, was continued in the German army until 1999. Ein Röntgenbus wird in Thüringen für die Untersuchung von Flüchtlingen auf Tuberkulose eingesetzt. So können Krankenhäuser entlastet werden. Eine Arztpraxis wertet die Aufnahmen binnen 24 Stunden aus. Das Röntgenmobil steht in Erfurt vor der Thüringer Staatskanzlei. Der Bus wird bei der Erstuntersuchung von Flüchtlingen auf Tuberkulose eingesetzt. The reach of that procedure was at 85–90% of all inhabitants in 1982 when they detected 4,6 infected people per 10.000. Q What was the advertised purpose, and if there was an underlying purpose different than that, what might it have been? As always with Germany, it has to be brought up that until 1945 there were around 150 doctors involved in this screening in a less than desirable "underlying" aim for it. Radiological sterilisation and castration. (src) 2% of all 360000 undergoing this procedure were 'treated' with x-rays. Not the answer you're looking for? Browse other questions tagged identification medicine public-health or ask your own question.